Just as expected, today, October 2, Samsung started selling its Gear S2 smartwatch in the US. However, only the Dark Grey variant of the Gear S2 is available to ship in the next few days, while the Gear S2 in Silver and the Gear S2 Classic (in Black) will be shipped in 3 to 4 weeks. Anyway, you can order any of the three models via Samsung's own website: the Gear S2 (in either Silver, or Dark Grey) costs $299.99, while the Gear S2 Classic can be purchased for $349.99. The Gear S2 and Gear S2 Classic are based on Tizen (not Android Wear), and sport 1.2-inch circular Super AMOLED screens with 360 x 360 pixels. They work not just with Samsung's Galaxy handsets, but also with a variety of non-Samsung smartphones running Android 4.4 or later and featuring at least 1.5 GB of RAM (here's a complete list of devices). While both the Gear S2 and Gear S2 Classic are water-resistant and feature rotating bezels (these help navigating through the UI), they look different: the Classic is called like that because it really resembles a classic timepiece, while the regular S2 has a futuristic design. Later this year, a Gear S2 3G will also be available in the US (and other markets), but Samsung didn't say exactly when, and neither for what price. now available @tmobile for free..
what u talking about willis? i checked out the sport at best buy and they didnt even have a display model the classic is shipping 4 to 5 weeks from samsungs page, the bezel makes it so small on your wrist. Please come back and post your experience after one day or so of usage and give us an idea how good it is. I ran out and bought the very first gear and it was cool but also disappointing. But I love my Gear S.
Very good so far, a little sad on the watch faces and apps as far as numbers go. But great on battery life even in always on mode. The gs6 however is suffering battery loss while connected. About 20% less than normal. I can see others thinking that it's small, however it seems like it's larger once on the wrist. (I also have small wrists) My one wish is app support. Even if they just pulled apps from android wear it'd be good. This Should Be Made Compatible With Ios Especially Since Android Wear Is And The New iPhones Have 2gn Of Ram. I am confused between gear s and gear S2. Gear S's screen interest me more than this one. Hardware is same. It comes to software only and rotating bezel. If gear S price drops to $200 I am getting it for sure. LOL, If I had money I would have Gear S when it launched. I can afford one. It looks awesome, Gear classic but $350 for smart watch sounds expensive. Even I buy s2 classic I would still feel like I am missing that great curved screen. Thanks, How's the performance on both, I know SOC is same but software is different? Do you feel difference? I would rather take larger watch than smaller one if right size is not available. Leaning completely towards gear S now. I'll sell you mine for $200. I would buy new one, thank you for generous offer though. Can you share how you liked it and why are you planning to sell? Get the gear s since it's more functional and cheaper and you get the 3G. I will see you my Gear S for $150 upfront and you take over the line from Verizon. Hit me up at techiexp1969 and of course I'm on Android. Hint hint. I am with at&t, so I can go for at&t or t mobile, I prefer t mobile because they have unlocked bootloaders which allows me to mess up with OS. How did you like gear S anyway? I like it so far. My main usage is when I go riding I don't have to carry my phone. Which was a big deal because my clothing doesn't have pockets. The storage is quite useful because I take the so go I want and just use my wireless headphones. The battery life is good as long as you set connection to auto, so it only uses 3G, when not connected to your phone. It is best to get the S on the same carrier as your phone. The only lyrics downside is the same as with all Gear models, app.support. but no biggie. I like being able to make my own watch faces. I still wished it had a camera like the first one. I could have storm Samsung had wearable before Apple. Apple comes 3 years later and can't even make a wearable that is better than the original Gear. 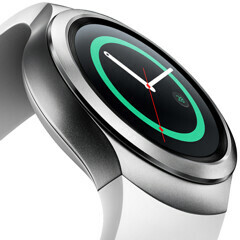 Now Samsung has 2 wearable that also have 3G capability to Apples ZERO. At least I can say about you Apple fans is this, you all.are consistently stupid and ignorant always starting trouble. Does Samsung non android wear receive software updates?